This Intira Jaroenpura movie page contains 9 records. Last century, during the reign of King Mongkut (1851-1868), a woman called "NAK" was married to a man called "TID MAK". They moved into a house in Bangkok's Phra Khanong district. After a while her husband was called off to war. Alas she was already pregnant. While her husband was away, she died with the baby still inside her body. So as Thai people believe, a woman who died with her baby creates a powerful spirit called "PHI TAI HONG THONG KLOM" (ผีตายโหงทองกลม). She became a ghost. As she still loved her husband deeply, she took a form of human being and waited for "Tid Mak" to return. Her husband didn't know anything about his wife's death. So when he came back home, his wife was waiting for him. Many persons did warn him that his wife was dead and that he was living with a ghost but he did not believe them. One day when "MAE NAK" was preparing the dinner and her husband bathing himself in the bathroom, a lemon fell from her hand. As the house was a Thai traditional house, it was built on piles and so the lemon fell on the ground 2 meters lower than the house's floor. So the ghost "MAE NAK" made her arm longer in order to get it. But her husband saw that, he understood that his wife was now a ghost. He managed to flee from the house and took refuge inside a Buddhist temple. "MAE NAK" terrorised the local population as an expression of her anger with them for helping her husband. Thanks to a monk, the spirit was imprisoned in an earthen pot and thrown in the river. 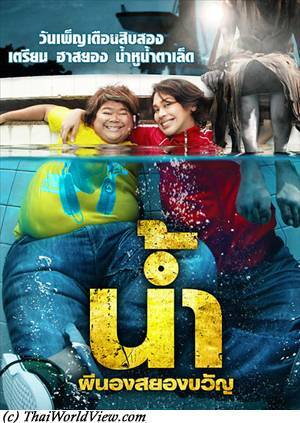 It is one of the the biggest success in Thai cinema (it grossed more than 150 million baht in Thailand). It is the story of "MAE NAK PHRA KHANONG" (แม่นาคพระโขนง). The spirit "MAE NAK" (แม่นาก) is not a dreadful spirit. She kills only to keep her husband. The love of "MAE NAK" towards her husband is beyond death. Many scenes are shot at night time with no additional lighting so making an eerie atmosphere. This movie has won awards for the best director, best art director, and best sound at Asia-Pacific Film Festival in 1999. Since the beginning of the Thai movie industry in 1923, the story of "MAE NAK" has been made and remade 15 times over. It is a modern remaking of a traditional tale, which evokes nostalgia (traditional house, buffaloes in field, quiet river...). The Culture Ministry registers 25 Thai classic films each year at the National Film Heritage Registry. This movie is part of the 25 films heritage list announced on 04 October 2014, which is Thai Movies Conservation Day.